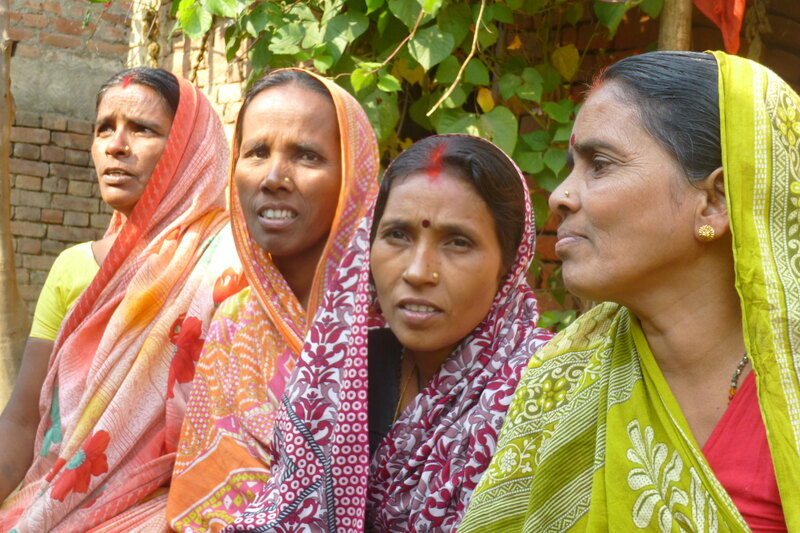 Now that Sambha, Prabhouti, Pavitr, and the other women in the self-help group know each other they can offer continuing support even though Chetna's direct involvement has ended - Photo by Sarah K.
Prabhouti’s husband had died, leaving her with four sons. The life of a widow is always hard in Prabhouti’s village – a woman’s standing and rights depend solely on her husband. Girls are not usually educated in Prabhouti’s community, so women left on their own lack any skills they can use to support themselves. A childhood encounter with polio had left Prabhouti unable to walk long distances, meaning her options were even more limited. Prabhouti’s widowhood should have been less painful, though, since her four boys would be available to support her. In Prabhouti’s culture, care for aging parents is seen as the responsibility of sons. One son is enough insurance for parents – four is a wealth of blessing. She arranged her eldest son’s wedding, relieved to have the first one settled. However, he and his new wife soon decided they couldn’t manage to support Prabhouti as well as themselves. He moved his family to another area of the village and ignored his mother’s pleas for help. The second son soon followed suit and left to find his fortune in the city. Left with two school-aged sons to support, Prabhouti suddenly found her situation more desperate than she imagined it could be. In this culture, the ideal woman enters her husband’s house with marriage at a young age and isn’t expected to emerge until she’s carried out on her funeral pyre. Her house and family become her entire world and she usually doesn’t know her neighbors. So Prabhouti had no idea that just around the corner, Pavitr was struggling in remarkably similar ways. Pavitr’s husband had died, leaving her with a son and daughter. Unlike Prabhouti, Pavitr was able-bodied. She also, however, lacked any sort of education to help her get a job to support her family. She had never been taught how to set long-term goals or make a plan to reach her goals. Each day was only followed by another one of hunger and fear of the next. One day, however, Prabhouti, Pavitr, and their neighbor Sambha were invited to join 10 other women from their village in forming a women’s "self-help and savings group". The village had never heard of such a thing and some neighbors warned them against joining. “They’ll just take your money and run,” someone cautioned. “What can a woman do?” others chanted the traditional refrain. Prabouti, Pavitr, and Sambha had very little to lose and, desperate, they joined over and against the objections of those around them. That was 12 years ago. The invitation came from Chetna, a partner ministry of SIM run by the Emmanuel Hospital Association. At the time, one of their strategic initiatives was to start self-help and savings groups in villages across their districts of concentration. They hoped that strong groups of women who’d learned vital skills would be able to carry on caring for their communities even once Chetna was no longer able to help them. In the self-help group, the women first started to save money, each one managing to find a way to set aside 10 or 15 rupees ($0.15USD) a month to put into the group savings account. Their monthly meetings included basic teaching about health issues, making good goals and plans, and community leadership. They discussed family and community issues and began learning how to advocate on their community’s behalf. They emerged from their houses to learn how to deposit their own money in the bank. They found a literate woman in their village who, with material Chetna provided, taught them to read and do basic sums. Sambha had already been running a small shop before she joined the group. Selling things like rice, sugar, lentils, and tobacco helped provide for her family’s daily needs. However, being illiterate meant that Sambha kept figures for her store in her head – including things bought on credit. She learned how to read, write, and keep a ledger in the women’s group. She became even more profitable once she had proper accounts and wasn’t at the mercy of customers’ honesty about how much they’d borrowed. Pavitr took what she learned from the women’s group and made not only a plan for her immediate future, but her children’s as well. She started a daily needs shop that soon made enough to pay for her children’s school fees. As a family, they’ve discussed possible career options and have decided to aim for government jobs in India’s massive railway system. When reminded of how much money training for jobs like that require, Pavitr folds her arms casually. “My children are studying really well. What’s with money when my children are studying so well? There will be money.” Pavitr sets aside money each month in anticipation of their future needs. Prabhouti knew running a shop would be too physically demanding for her, so she used her savings from the group to purchase the supplies to make a local potato snack. Every morning, she makes them and every afternoon sells them to people returning from school or work. It helps support her and her two sons. The oldest of the two left has started talking about leaving the village to find work somewhere else. Prabhouti worries she won’t be able to get the supplies to make her snacks without his help. If he leaves, however, this time Prabhouti won’t be completely alone. Just around the corner is Pavitr and across the street is Sambha – neighbors she didn’t know before the self-help group. They’ve learned so much more than savings and self-help. The group taught them about community and what they’re capable of when women come together.